My first Gail Carringer book was Soulless, which was the first book in the Parasol Protectorant series. I was immediately hooked and read all five books in the series within less than a month. I guess you could say I devoured them. 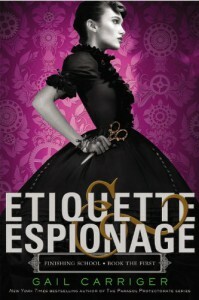 When Etiquette and Espionage came out, I was reluctant to pick it up, not because I thought it wouldn't be good, but because I loved the other series so much that I was afraid I would compare it and be disappointed. I wanted it to have a fair chance. I'm not really sure what made me choose now to grab the first book in Carringer's Finishing School series. Maybe it was the lure of the British dialogue, the Victorian steampunk setting, or knowing that I was most likely about to meet a strong sassy female heroine that I would adore. The reality? I got all three of these and more. The characters and their adventures gave me the same joy as the first Harry Potter book. Sophronia is truly a girl ahead of her time whose family doesn't appreciate her love for technology and books. They send her to finishing school, but no ordinary finishing school. Sophronia and her friends are learning how to gather intelligence, spy, and if need be, kill, and to do it all with perfect poise and impeccable manners. I love Sophronia's spark. 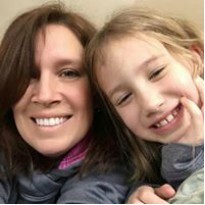 She is smart, spunky, and unafraid. She, Soap, Vieve, and her other friends embark on several covert missions that include both suspense and a bit of humor. One minor character I especially adored was Bumbersnoot, the mcanimal dog, who was an accidental acquirement at the beginning of the book but ended up being of the utmost importance to the main mission. The story is perfectly paced with just the right balance of action, character development, and setting detail. I closed this book smiling and have already grabbed the second one on Audible. I'm really looking forward to seeing what happens to these characters next. There is also an entire website dedicated to the series and the Academy. Well worth checking out. You can find it at http://finishingschoolbooks.com/ Enjoy!